If you've noticed that it's been a little quiet around here, that's because we've all been down with colds for the last week and a half. Nothing like having the whole family sick at once! Anyway, we're on the mend, and managed to get a little work done over the last few days. Finally, the new edition of the Silly Duck pattern is ready! You can find it on Ravelry and Etsy (if it's sold out, don't worry as I'll list more copies as soon as I notice). You can also get it on Lulu - there was a problem with the cover editor over there, so click the preview link below the cover image to see what the pattern looks like. Here's the tricky part: if you bought the old pattern, and want a copy of the new one, there are 2 options. 1) If you bought it on Etsy, just email me, I will look up your receipt, and send you the new pattern. 2) If you bought in on Lulu, you need to forward your receipt to me, because I don't see who buys patterns on Lulu. It is quite different from the old pattern, which is why I couldn't post part of it here on the blog, like with the Mouse and Panda. The beak is now knitted, so you don't need to worry about finding felt or doing any hand-sewing. The feet are now much more duck-like, as is the body shape. The whole toy is knit flat on straight needles, except for the hat which is knit in the round on dpns. If you've been wanting to learn how to use them, though, a little hat might be a good place to start. I used Elann's Bamboo Fusion for the main colour of the duck, and I think the shine of the bamboo makes the knit fabric look just a bit like shiny duck feathers. 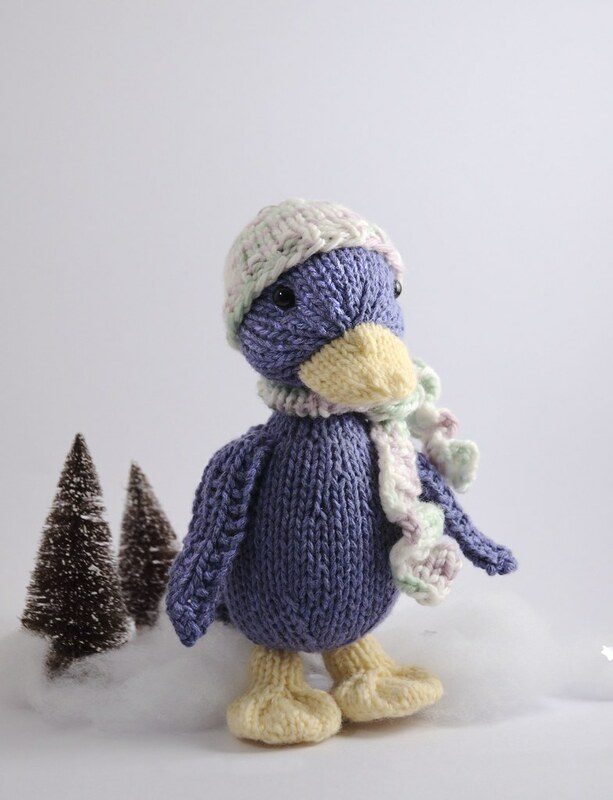 The beak and feet are in plain worsted wool, and the hat and scarf and knit in a bit of variegated wool I had in my stash (I don't remember the brand). Somebody is cranky, so I have to go. I hope you all enjoy the silly pattern! Posted by Barbara Prime at 9:32 a.m. I am a little confused at this point. I have 3 of your products, fuzzy knits e-book, festive knits e-book and something else. These are from when they originally were published, so now what? January 14, 2010 at 3:09 p.m. The new Silly Duck pattern is replacing both the old Silly Duck and Fluffy Duckling patterns, so if you bought the original Fuzzy Knits, you can get a copy of the new pattern. January 14, 2010 at 7:03 p.m.
January 19, 2010 at 5:56 a.m. I have looked everywhere, high and low and I cannot find a receipt for when I bought fuzzy knits. I found Festive knits on Lulu, was there somewhere else I could have bought this? January 23, 2010 at 1:56 p.m.
Deborah: Lulu is the only place the download version of Fuzzy Knits is sold. I have sold some printed copies in my Etsy shop. January 30, 2010 at 11:45 a.m.